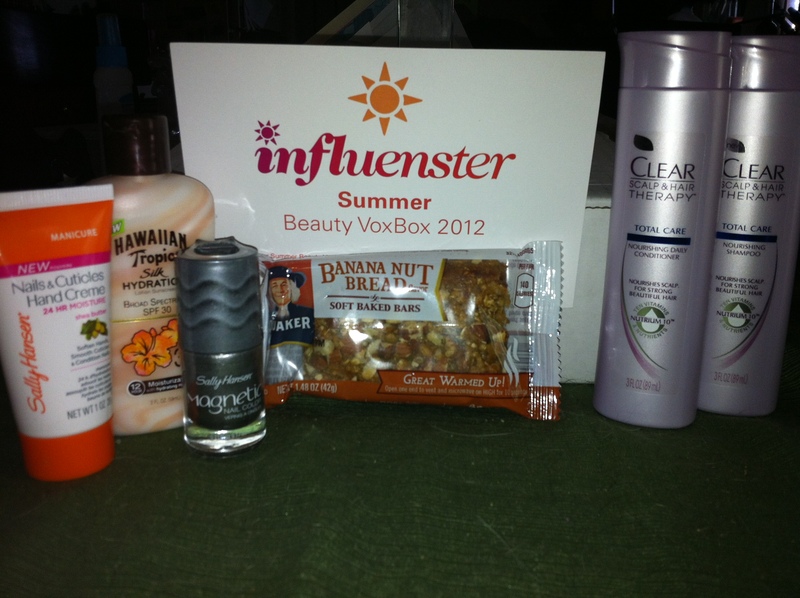 My Influenster Summer Beauty VoxBox! Last month, a Twitter friend of mine told me that if I was a glamour and beauty junkie–which we all know I am–then I had to sign up to be a future recipient of an Influenster box. (By the way, I’m a Twitter regular, so if you are on board, follow me @SassyAuburn).What exactly is this, you ask? Well, it’s a box mailed to you, based on items you indicated you might like from a survey, filled with all kinds of goodies for you to try and review. To good to be true? I thought so… until I was chosen to get the Summer Beauty VoxBox. WOOT! I got it a few weeks ago and it was like Christmas in July. All kinds of stuff from food to beauty supplies to play with and review. OMG, it’s like a Sassy dream come true. I encourage all of you to sign up as well so you too could be chosen in future months. No purchase necessary. No pestering emails or phone calls. It’s easy peasy and fun as heck. Go here to sign up! Hawaiian Tropic Silk Hydration – Hawaiin Tropic is a staple in most summer-lovers’ beach bags. This yummy product protects your skin from harmful UVA and UVB rays with an SPF of 30, all while keeping your skin silky smooth and smelling like the islands. Many sun blocks irritate my skin, but not this one. My skin stayed moist, I stayed protected while I worked outside, and the scent was awesome! It’s nice to have a product that doesn’t just keep me safe but also keeps me soft! Sally Hansen Magnetic Color – Everyone knows that Sally Hansen is a leader in the hand and nail industry. Their newest product, Magnetic Color, isn’t just a nail polish but is a nail polish with a funky edge. On the top of the bottle is a magnet. Yup, a real magnet (I put a paperclip on it to test it!). After you put on your second coat of polish, you hold the magnet over your nail while the polish is still wet for about 10 seconds. When you move the magnet away, you’ll see these colorful waves on your nails! It took me a couple of tries to master it, but once I did, I loved the look. And so did others…. I got many compliments on how they looked. I was sent the color “Silver Elements” to try which goes with everything, but I plan on picking up “Polar Purple” as well. It’s a long-wearing nail color in a league all its own! Quaker Soft Baked Bars – Oh yeay! FOOD! Let me just say, if you want to get my attention, send me food! These yummy little snack bars are soooo delish. They are healthy, easy to take with you for times on the go, and come in great flavors: banana nut bread and cinnamon pecan bread. Perfect when time is of the essence in the morning or when you need an energy boost later in the day, Quaker’s Soft Baked Bars are packed with 6 gr. of protein and 20% of 5 essential B vitamins. I love the soft texture and the taste is fab. These are always in my cupboard for whenever I need a fast, good-for-your body nomnom! Clear Scalp and Hair Therapy – Every time I go down the hair products aisle at the store, I get dizzy. I have come to the conclusion that there is a product for everything. Dry hair, oily hair, frizzy hair, thick hair, thin hair, color-treated hair, hair that needs oomph, hair that needs to calm down, you name it. But do you know of any shampoo and conditioner that focuses on the scalp instead of the hair? Probably not. But Clear products do. It starts by taking care of the hair where the hair starts—the scalp. By giving the hair a healthy, strong foundation, you can get luscious hair in days. I like the way Clear Scalp & Hair Therapy shampoo and conditioner worked on my hair. It didn’t strip away the color, made my hair soft and shiny, and kept my scalp feeling clean for days. I like a product that does what it says it’s going to do and Clear did just that! Sally Hansen Nails & Cuticles Crème – …and speaking of Sally Hansen, when you aren’t wearing one of their jazzy nail colors, what else can you do to keep your hands looking young and feeling soft? You can use their Nails & Cuticles Crème. I think this was my favorite product of all in my VoxBox. The hand cream has a light, refreshing citrus scent and is infused with shea butter to keep your hands smooth and silky for 24 hours. Everyone knows that hands are one of the biggest giveaways of your true age, so you want to keep them moist and prevent your cuticles from cracking and peeling. Sally Hansen’s Crème does just that. I’ve noticed a significant difference in how my hands look and feel, a difference I like. Plus my nails have seemed to grow in faster & stronger since I started using it. That’s something I REALLY like! So, are you interested? Do you want to be an Influenster too? Come on board with me so we can talk about the great new products we will be testing in the future. Influenster’s Summer Beauty VoxBox was filled with the perfect items to keep me looking and feeling healthy each and every day this season! And I found some great new products to add to my beauty routine as well!